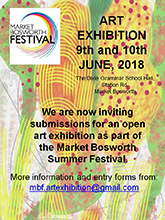 Now inviting submissions for an open art exhibition as part of the Market Bosworth Summer Festival. Each artist can submit up to THREE pieces of work. Submit entries as soon as you can as space is limited. 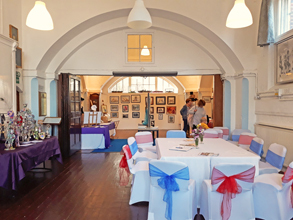 Last year's exhibition was really popular with 80 artists showing their work, 242 pieces of art, 806 visitors, 34 sales and £2325 income for local artists. 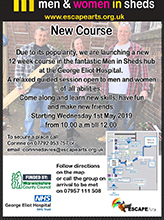 Due to its popularity, we are launching a new 12-week course in the fantastic Men in Sheds hub at the George Eliot Hospital. A relaxed guided session open to men and women of all abilities. Come along and learn new skills, have fun and make new friends. Call the group on 07957 111508 to be met on arrival. 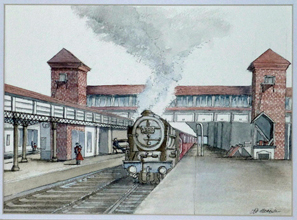 The Station Gallery, Platform 1, Nuneaton Railway Station. The cost of the workshop is £25 which will include all materials and refreshments. £10 deposit to be paid on booking. There are a limited number of places available so early booking is recommended. 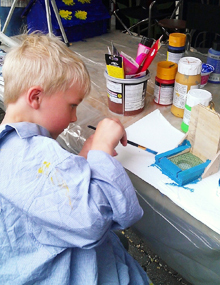 Come and have a go at creating a plastic dry-point plate and printing in two colours using our fabulous printing press. Please bring lunch and any images that inspire you. We ask for a £5 donation to cover materials and refreshments. Spaces are limited so please contact Mel to book. 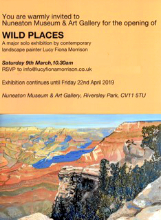 A major solo exhibition by contemporary landscape painter Lucy Fiona Morrison. Art Alert members are invited to attend the opening at 10:30amon Saturday 9thMarch to celebrate over refreshments with me. 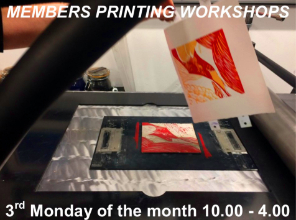 I'm pleased to invite members to an exciting new series of workshops using our printing press at the Art Alert Station Gallery. Monday 4th March with Alisha Miller. For more information please contact each artist directly. Workshops are limited to 8 people, booking is essential. We ask for a £5 donation towards refreshments and materials. You are invited to contribute towards creating a new public artwork. responding to artwork designs created from art sessions within our community. You are welcome at all or individual workshops. 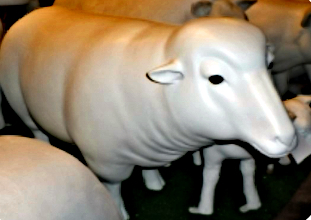 Mixed media exploration, using acrylic paint to decorate the sheep. Exhibition runs from 16-30th March 2019 at the Station Gallery. Bring your own materials and projects and get creative whilst enjoying the company of like-minded people. 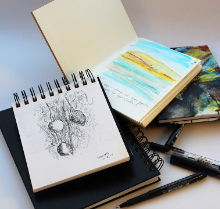 Join us in a sketchbook challenge.! There will be a daily prompt and then it’s up to you as to how you take the challenge up. 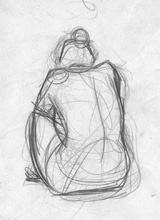 Five minutes with a pencil, half an hour with a crayon… totally your choice. The point is to have fun sketching. Pam Hyams has started a WhatsApp group. This will be used to view and share progress. If you’re interested in being in the group, please let me know and I’ll pass your details to Pam. Posting your sketches on the group is entirely up to you. Pam will also be posting some pictures from the WhatsApp group onto the Open Art Trail Facebook page. If you’re happy for your work to be posted there, again please let me know. We’ll have a Show and Tell at the next Art Alert meeting on Friday 1 March, so there’s plenty of time to catch up if you get behind by a day or two. 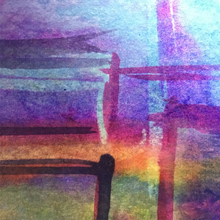 Would you like to try making monoprints using our fab printing press? 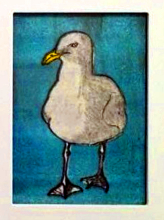 We will be creating monoprints using a variety of techniques e.g. 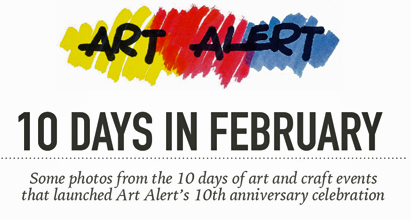 10 DAYS FOR THE END OF ART ALERT’S 10TH YEAR! We have lots to celebrate at the end of our 10th year. It will be fab to see you at any/all of these sessions. Professional national and international artist Spencer Jenkins is best known for his amazing sculptures using willow and steel, including six magnificent arches at Windsor Castle - a gift for the Queen celebrating the 60th Coronation, the cover for Black Sabbath’s album 13 and furniture for gardens at Prince Charles’ residence Clarence House and The Chelsea Flower Show. 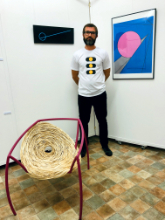 This exhibition sees Spencer taking a new direction with his work, he is exhibiting a new collection of stunning prints developed using iPhone and iPad apps and a series of wood, steel and willow sculptures inspired by the digital images. Spencer's solo show opened on Friday 16th November and Spencer will be at the gallery for the next month by appointment everyday and on site Thursdays, Fridays, Saturdays and Sundays (see Opening Times above) - please pop in and see him if you are passing through Nuneaton Station. The trail is over for another year and there is a lull between Halloween and Christmas so it’s the perfect time to invite you to join us for a Post Trail Gathering! Feedback is always important for us and this is a chance to raise issues and share experiences. We hope you will be able to join us. If you are unable to make it, a brief email about how your weekend went i.e. venue/sales/visitors etc. would be most helpful. Looking forward to meeting up on 13th. 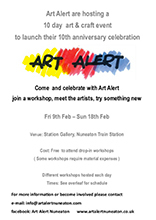 All dates below are 1-4 pm at the Art Alert Station Gallery, Nuneaton Train Station – price £10. He doesn’t teach the class together so it doesn’t matter if you are a complete novice or can’t make every class. 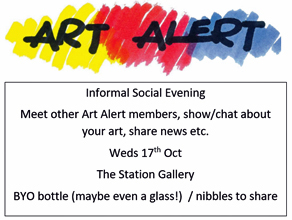 Art Alert held their monthly meeting at the Station Gallery, Trent Valley Station on Friday 2nd November. Opening times for the gallery were discussed and it was agreed that the group would have set opening hours for members exhibitions which could be displayed clearly outside. 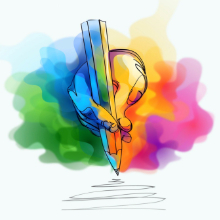 Members of Art Alert are invited to take part the Hope Festival, Abbey Theatre on 12th and 13th October 2019. This two-day event is to celebrate the life of Dipak Patel, a volunteer at the theatre, who died suddenly. 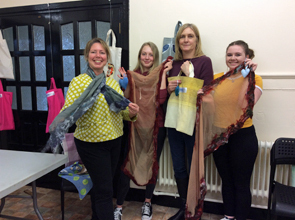 Several members are already planning to become involved with poetry reading, stitchwork and glass and the theatre is looking for members to participate with art displays and workshops. Art Alert are delighted to hear that member, Nadine Shaw has been commissioned by the Mayor, Christopher Watkins to do a painting of St Marys Abbey Church, which will hang in the Town Hall. Nadine has been a member of Art Alert for many years. 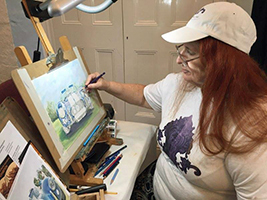 After suffering a heart attack two decades ago that enforced early retirement, Nadine started to paint the landscapes that inspired her whilst touring in her caravan. 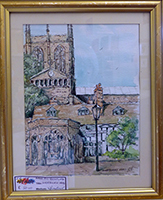 Nadine also belongs to Nuneaton and District Art Society as well as taking a class at Bedworth Art Centre. 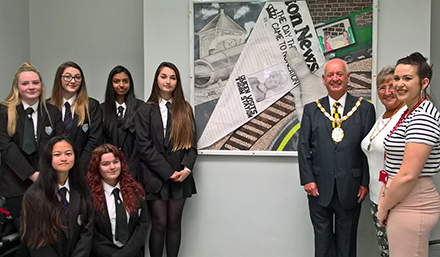 Prints made by students from Hartshill School, Etone School and members of Art Alert, led by artist Alisha Miller and inspired by propaganda and publicity material created by the Arts Suffrage League (ASL) and the Suffrage Atelier (workshop) (SA). £45 - payable in advance - to book contact me direct for BACS details or address to send cheque or bring cash to Station Gallery on Friday 5th October 11am. A3 drawing boards, cartridge paper, pencils, charcoal and pastels, masking tape and some acrylics provided. Bring your own watercolours, fine line pens, acrylics, watercolour paper/sketch books. You can always bring your own materials to any class and work in a medium of your own choice. Below are the techniques I will teach on the day, we begin all sessions with quick warm up sketches. Individual tutoring for all. Large drawings - A2 - Pencil sketches, then charcoal onto white paper. 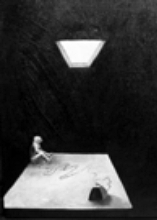 Please bring fixative or hairspray, I will supply large cardboard sheets as drawing boards, but if you have A2 drawing boards please bring you own and paper, you may want to bring an easel. B & W acrylic paints - you will need to pre stretch your paper or bring acrylic, watercolour or heavy duty paper. I can supply the acrylic, but if you want to bring you own you will need - viridian, crimson and white. Watercolour and line - you will need to pre stretch your paper or bring watercolour paper, you will also need fine line pens, watercolours, palette and sponge. PLEASE FEEL FREE TO PASS THIS INFORMATION ONTO OTHER MEMBERS OF YOUR ART CLASS OR ANYONE WHO MAY BE INTERESTED IN COMING ALONG! Inspired by dreams, surrealism and gouache painting. An exhibition of images by The Art School Art Class led by Alisha Miller. 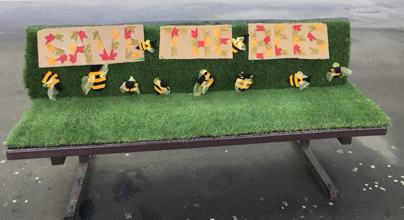 Benches at Nuneaton train station are due a colourful transformation as part of a project run by local art group, Art Alert. 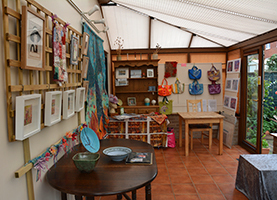 Art Alert has used space at the station for exhibitions since 2017, is dedicated to getting local people involved in arts and crafts. 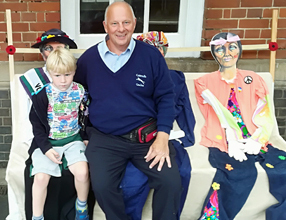 On Saturday 8 September, the group is holding an event called ‘Seats of Inspiration’, which sees Art Alert members and friends creating art to be displayed on train station benches for the day. 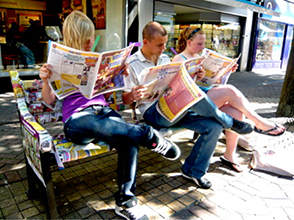 The ‘guerilla-style’ project forms part of Art Alert’s 10thanniversary celebrations and is intended to capture the public’s reaction to unexpected pieces of art. Members of the public are also being encouraged to participate in ‘Seats of Inspiration’. 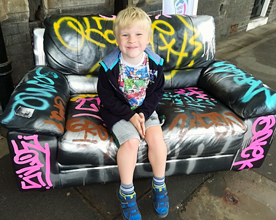 Budding artists can submit a piece of 2D or 3D artwork to be hung in the Station Gallery or can take part in a ‘decorate a chair’ session, which will run from 11.30am until 2.00pm on Friday 7 September. The pop-up art event falls shortly before the 2018 ‘Open Arts Trail’, which showcases the work of artists and makers around Nuneaton and North Warwickshire. 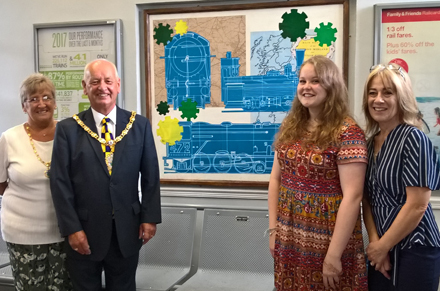 Francis Thomas, head of corporate affairs at West Midlands Trains, said: “Art Alert never cease to amaze and the group’s artistic contribution to Nuneaton station is always wonderful to see. “As a train operator, we want to forge close links with the communities across our network and our relationship with Art Alert just goes to show what can be achieved through collaboration and sharing of space and resources. 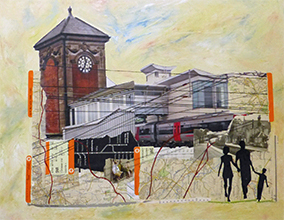 ‘Seats of Inspiration’ is going to be a great event and we hope that passengers and the public are surprised and delighted by the work on show.” Art Alert has strong links with West Midlands Trains and breathed life into a formerly-disused waiting room at the station when it was turned into a public art gallery. 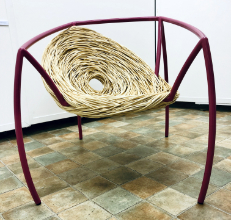 Open Arts Trail showcases artists and makers in and around Nuneaton and North Warwickshire, with exhibitions taking place on 22rd & 23rd September 2018.
and view some of the hand-made bespoke woodcraft pieces created by them. Refreshments, nibbles and cake will be available. All sorts of subjects painted for the sheer delight of it! Pop in and chat about why I do and what I do and all that stuff! Open times 9 till 5 on the dates above closed on 25th, 26th, 28th Aug and 2nd Sept 2018. 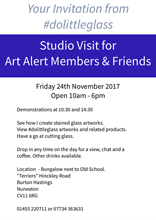 Art Alert members will be showing work and doing demos. All sites will have light refreshments available. 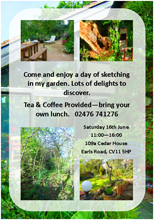 Contact Eileen Young 07594 455393 for access for artists to visit to create art and display outdoors. 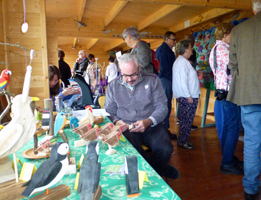 Over 200 artists demonstrating, selling and inspiring. Captivating performances, creative workshops, delicious street food, amazing live music. 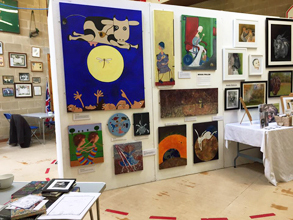 Visual arts and crafts people interested in showing/selling their work - the closing date for entries is Friday, June 29th 2018. Your prints will feature in an exhibition at the Station Gallery Autumn 2018. 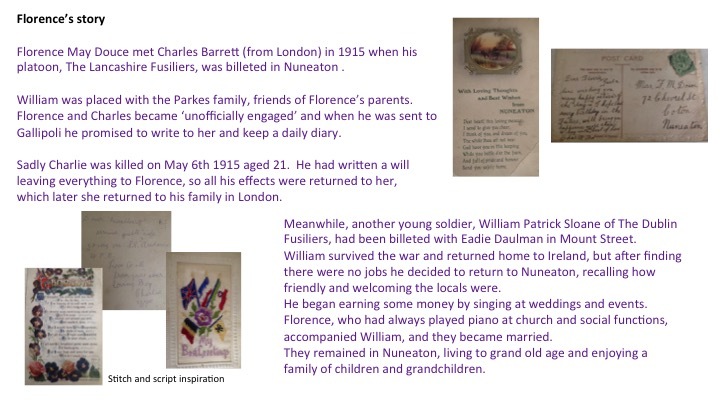 Art Alert are delivering a community project inspired by the propaganda and publicity material created by the Artists Suffrage League (ASL) and the Suffrage Atelier (SA); these were groups of artists who organised specifically for the purpose of providing visual materials for the suffrage campaign. Note: You will need to book an all day session, or book one morning and one afternoon. Atkins Gallery Open Exhibition returns this summer with a new brief to inspire local artists. This year's theme is Portrait. 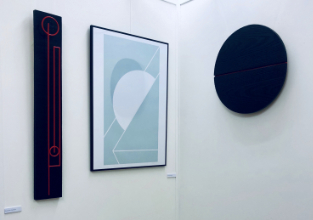 Artists can submit up to three pieces for £12 (instructions on making the online payment is included in the pack) and artwork is to be submitted between 25th – 29th June and be collected after the exhibition between 31st July– 3rd August 2018. 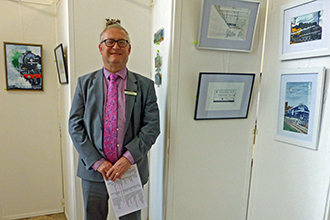 Art Alert held their AGM at the Station Gallery, Nuneaton Trent Valley on Friday, 6th July. Roger Elsegood (Chairman), Pam Hyams (Committee member) and Anne Taylor (Secretary) have stood down and newly elected is Corinne Davies (Chair), Sadie Read (Secretary) and Ali Woolacott (Committee Member). Other posts will remain the same. It was decided that meetings may be held on alternative mornings and evenings of the first Friday of the month as many members work and miss the opportunity to attend meetings. The "Decade of Doorways" exhibition at Nuneaton Museum and Art Gallery has now finished and was a great success with many favourable comments from the visiting public. Following this, on the Gallery Landing will be a solo exhibition by member Hilary Morris. There is still time to catch Hilary Morris's exhibition ‘Simply Coastal’ at Nuneaton Museum and Art Gallery, which will be on show until 16th September 2018. 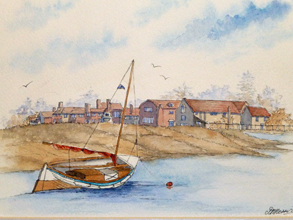 The pictures are inspired by Hilary's visits to the British coast and her medium is pen and wash. The work includes paintings of harbours, estuaries, beaches and boats from Devon and Cornwall to Norfolk, Yorkshire and Wales. 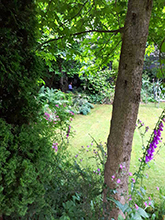 In the Garden of 109a Earls Road... What a brilliant day on Saturday! 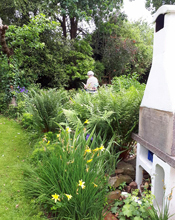 Despite a wet morning and a not very good forecast for the afternoon, 10 people showed up to join me in my garden for a day sketching au plein air. The rain held off and we had enough bursts of sunshine to make it an altogether pleasant day. Fortified with numerous cups of tea and a general air of discovery and encouragement all the artists created sketches in a variety of media and with a variety of viewpoints. Amazing how you can see your own garden in a different light through someone else’s eyes. The Graduate Show from students of North Warwickshire and Hinckley College at the Hinckley Campus who will have completed a BA Hons in Visual Media featuring 2D and 3D work in range of styles and mediums. 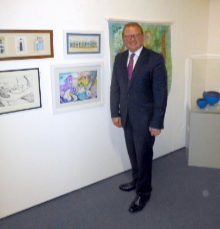 Art Alert hosted a private viewing of their exhibition at Nuneaton Museum and Art Gallery on Friday evening 25thMay, which was attended by the Mayor and Marcus Jones MP. 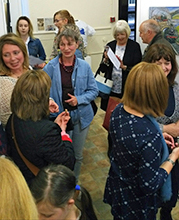 This was a chance for friends and family to have a preview of the exhibition that will be on until 8th July in the Yellow Gallery, and it was extremely well attended. On Friday 8th June, some of the artists will be at the Museum at 11.00am to give the public a chance to meet and chat with them about their work. 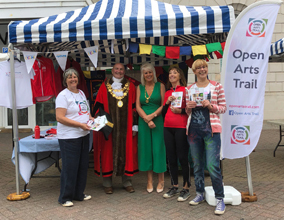 The next event which Art Alert will be taking part in is the Open Arts Trail, 22nd and 23rd September and artists have just two weeks left to register. 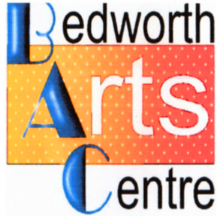 There will be arts and crafts on display at different venues around the Nuneaton and Bedworth area. 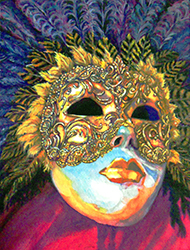 This month we are featuring not an artist, but a group - Bermuda Art Club. 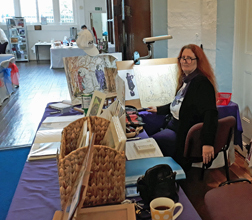 They meet every Tuesday at the Phoenix Centre, Bermuda Rd, from 11.00am to 3.00pm, and are a small friendly group of artists who draw and paint for pleasure. The group provides a selection of materials and assistance to help members achieve their aims. 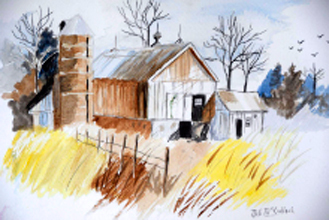 The artists practice their skills using watercolour, acrylics, gouache, inks and linocuts. Refreshments are available or members can bring their own lunch. The centre can be reached by no.17 bus or car. Reclining pose in pencil or paint of your choice. I have a selection of easels and donkeys - only enough for half a class- and i can provide A3 drawing boards and A3 cartridge paper, water pots, basic acrylic paints, pastels, brushes, charcoal and pencils. Please bring your own watercolours and palettes. You are always welcome to provide your own materials and if you want to work larger than A3 I can supply A2/A1 paper at cost price of 30p and 50p per sheet, please bring a large drawing board if you want to work bigger than A3. Refreshment will be available throughout the day for a small donation. Nearest Car park - Empire Gym (Free after 6pm)/ next to Dunelm car park. An opportunity to just come along and browse some of the fantastic work this long-standing art group have produced and most of the art work displayed will be available for sale! 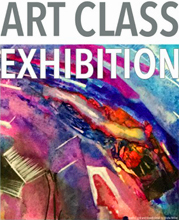 Art Alert held their monthly meeting at the Station Gallery, Trent Valley on 4th May at 10.00am. Anne Becker confirmed that everything is in place for our second exhibition "A Decade of Doorways" at Nuneaton Museum and Art Gallery which starts on 26th May. 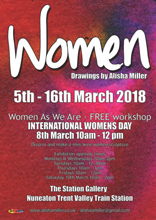 Alisha Miller confirmed that she is holding three life-drawing classes at the Gallery on Saturday, 19th May and 11th and 25th June. For further details you can ring Alisha on 07876 118474. Ali Woolacott and Tracy Swain had a very successful exhibition "A Splash of Colour" at the Gallery that attracted over 100 visitors. Len Barnes told the group about a visit by officials from the rail franchise at Trent Valley who were impressed by the current exhibition and also with what Art Alert were doing generally with the premises. It was thought that some signage and maybe window boxes could raise our profile and draw in more visitors. 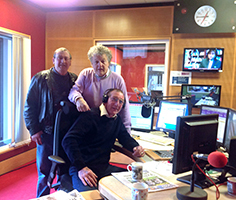 Three members of "Stitches" have won Festival of Arts Awards and Debbie Squires was congratulated on winning a First. 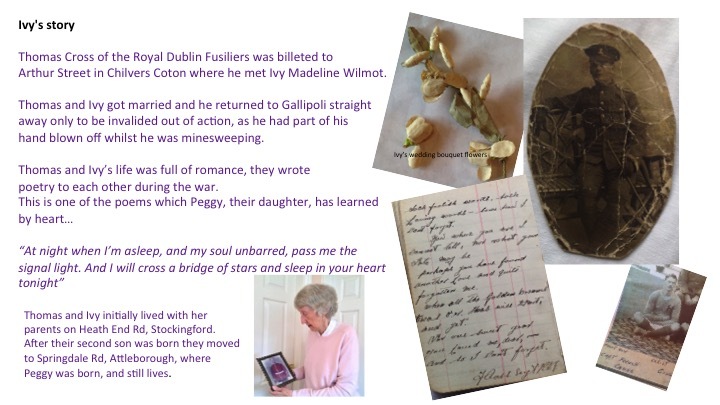 Debbie is our first Member in a new feature of our Monthly News - Showcasing the Artist. 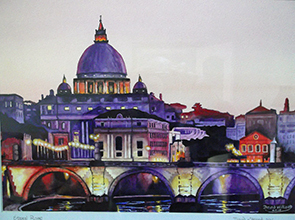 Debbie is an award-winning artist with a First Class Degree in surface decoration and PCG with Merit in Fine Art. She was finalist in the HDTI Competition, Coventry and joint winner in the Volvo UK Design Competition (Textile Triptych for Corporate Interior). Debbie has been a member of Art Alert for several years and was one of the artists on the "Godiva Wakes" project. She describes her work as ‘awash with colour, texture and multi layers’ - and her work is not limited to any textile medium. She likes to use an eclectic mix of materials mainly working to commission, from large pieces of wall art to elaborately decorated handbags. Along with other artists, Debbie's work will be on display at the Heritage Centre, Coton Arches for their Open Arts Trail, September 22nd and 23rd. 10% of Debbie's sales will go to McMillan Nurses. 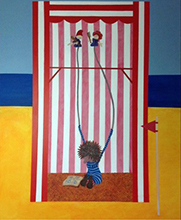 You can see more of Debbie's work on her website www.debsquires.co.uk. Come and celebrate with your Art Alert friends. Bring your nearest and dearest (& friends & family!) Live music by Andy Wolf. No bar or catering so bring some food for a shared table & bring your own drink. Meet the artists on Saturday 7thApril from 10am. Exhibition open: Mondays, Wednesdays, Fridays 12-4pm, Saturdays 10-2pm. The centres opening times are Mondays, Tuesdays & Thursdays - 9am till 2pm, Wednesdays 9am - 3pm, Fridays 9am - 10am, Saturday's 9am – midday. 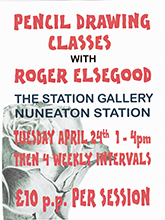 Held at the Station Gallery, Nuneaton Trent Valley Railway Station. Refreshments available for a small donation - please bring you own lunch on Saturday. Please call or email to book in advance (latest booking taken 1 hour before class) however spaces are limited so book early to avoid disappointment. There will be a series of poses over the two days as not to repeat first session just in case anyone wants to book on both! I can supply pencils, charcoal and watercolours, A2 cartridge paper 20p per sheet, I have a small collection of brushes and water pots. I can supply acrylic paint but Primary colours only and white, however it's always best to bring your own materials and equipment if you have them.Please bring a Drawing board and easel if you wish to work larger than A4 - a putty rubber, a palette, a water pot, watercolour paper (if you prefer) and kitchen roll. Some images from the 10 days of art and craft events that launched Art Alert's 10th anniversary celebration. 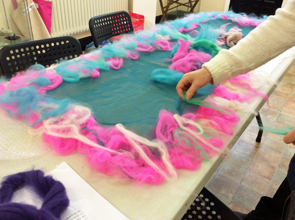 Six attendees came along and had a go at making felted Nuno chiffon scarves. We had a fun relaxed session agitating merino wool into beautiful chiffon scarves to produce some wonderful and interesting designs. Myself and Ali organised a workshop exploring watercolour techniques that was suitable for adults and children. We used a theme of sunrises and sunsets so we could create some dramatic scenes. I brought photos taken of the sunrise at Hartshill and sunset photos from Wales. In the event we didn’t have any children but 5 adults, including professional and amateur artists came along to find out what was happening. One visitor was a local parent who brought her paintings in to show us, it was quite emotional for her it was the first time she’d shown her work to other artists. We gave her support and encouraged her to come along to an art alert meeting. Myself and Ali had an enjoyable afternoon playing with paint and it felt really worthwhile to be in the gallery so people could drop in and chat with other artists. We realised that because we had advertised it as a painting and children’s workshop that people may not have understood it was for all ages. There was a bit of learning for us there for the future. 10-day art & craft event to launch their 10th anniversary celebration. 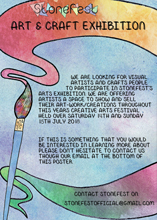 Come and celebrate with Art Alert; join a workshop, meet the artists, try something new! Cost: Free to attend drop-in workshops (Some workshops require material expenses). Different workshops hosted each day: See table below for schedule. drop feed dog & embroidery foot. 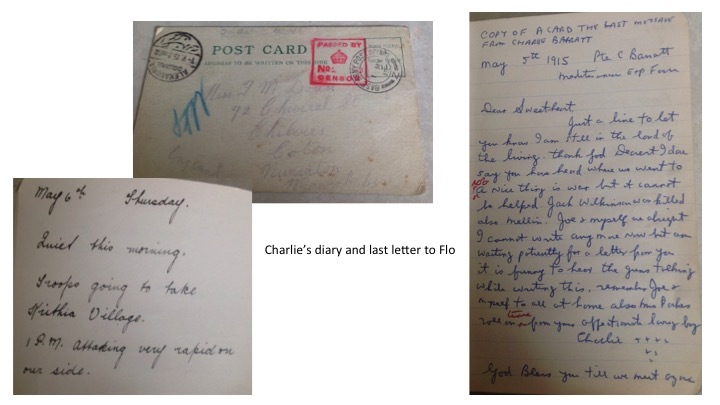 1 For participants on 'gathering memories' project. Absolute requirement - participants must have an electric sewing machine with drop feed dog and an embroidery foot. This is a taught session and will have a £5 fee per person. Sewing threads and some fabrics will be provided. We will be investigating printing, the use of bondaweb soluble film and 3-D free machine embroidery depending on time restrictions. I will be demonstrating various techniques throughout the day. You are welcome to carry on stitching till 3pm, but this session will be un-taught. Please respond by25th Jan. If over subscribed names will be drawn from a hat. 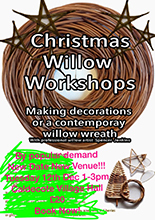 Making decorations or a contemporary willow wreath with professional willow artist Spencer Jenkins. An exhibition of work made by members of LoveLego Club. Station Gallery, Nuneaton Trent Valley Railway Station. 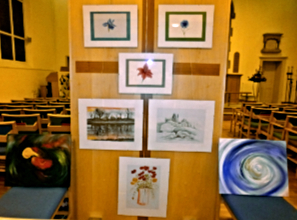 A collection of paintings, drawings, mixed media and project work by the Art School Art Class, led by Alisha Miller at Caldecote Village Hall. Meet the teacher - 10am - 2pm Saturday 25th November 2017. 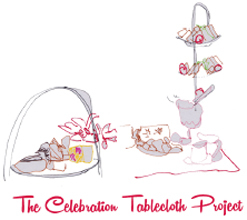 CELEBRATION TABLECLOTH PROJECT FEATURED ON BIG LOTTERY SOCIAL MEDIA SITES! it’s received a lot of interest from the public! 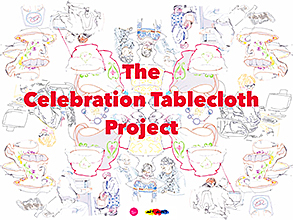 Art Alert would like to share with you a slideshow (PDF document 6.6mb) of the Celebration Tablecloth Project. Many lovely things happened as a result of this year long event, including friendships formed, community bonds strengthened, new experiences and skills acquired and improved communication/sharing across the project. We thank Big Lottery Fund 'Celebrate ' for the funding to make this project possible, and most of all, we thank everyone who took part. OPEN ARTS TRAIL DRAW 2017 WINNER! 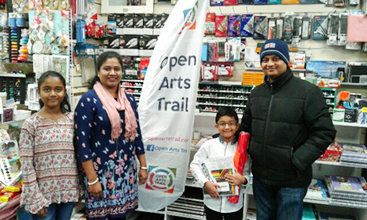 The lucky winner of the draw for this years Open Arts Trail prize of £50.00 worth of art material was presented with his prize on Saturday, 25th November at Abbeycraft ArtWorld in Abbey St, Nuneaton. The winner is Omkar Nashipudi, a budding young artist from Nuneaton who was celebrating not only his win, but also his 7th birthday falling on the same day! 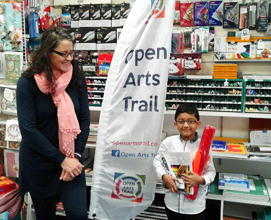 Omkar enjoys drawing and painting flowers and his favourite colour is blue. He was given a helping hand on the day by his mum and dad and his sister who filled a shopping basket with various goodies from the well stocked store before being given an extra surprise birthday present of even more art products by Sam Hollis of Abbeycraft . Also present to congratulate Omkar was Mike Quinn from the Open Arts admin team. Mike said ‘ It is always great to see youngster’s taking an interest in the arts and who knows, we may well see Omkar exhibiting his work in the future. 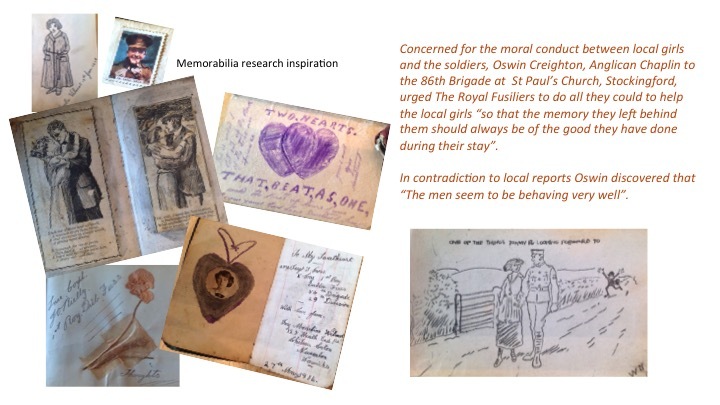 We may need to look at a section dedicated to the work of children at next year’s trail which will take place on the 22nd and 23rd September 2018’. 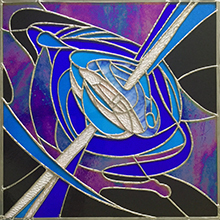 See how Brian creates stained glass artworks. View ♯dolittleglass artworks and related products. Have a go at cutting glass. Drop in at any time for a view, chat and a coffee. Other drinks available. Come and have a go - or just watch! A showcase of local history & heritage inspired projects. Plus the launch of their 'Green Heart' project. 10 artists will be exhibiting their work as part of the Open Arts Trail 2017. 23rd & 24th September 2017 between 10am and 4pm at Mary Ann Evans Hospice. 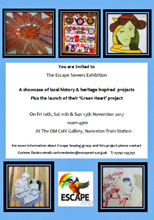 Art Alert met at the Station Gallery, Nuneaton Trent Valley Railway Station at 10.00am Friday, 1st September 2017. There was a good attendance and most of the meeting was concerned with final arrangements for the Open Arts Trail to be held 23/24th September. As last year's event was such a success, this year there are even more venues and more artists taking part. There are thirty two artists and ten art groups who will be exhibiting at twenty different venues around Nuneaton, Atherstone, Bedworth and Fillongley. Trail maps are available from several venues including Nuneaton Library and Abbeycraft Arts. The Group welcomed a new member, Les Barnes. 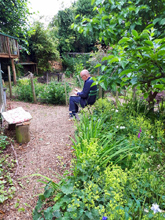 Les likes to paint outside, and it was on one of his painting trips at Trent Valley Railway Station that he popped into the café for a coffee and picked up one of our leaflets which led him to the group. 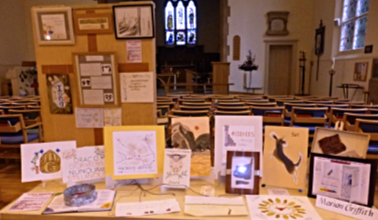 Several of the group have been successful with showcasing their work. 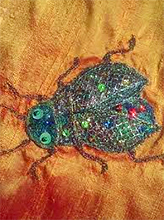 Debbie Squires has just had a very successful exhibition called "Splendour of Stitch" in Lutterworth. Becca Pullen has been travelling around Shropshire to promote her work and has several venues interested, including hotels in Ludlow, and Brian Dickinson will be producing work for a Space Conference in October. The Group are hoping they will be able to keep their premises at Nuneaton Railway Station as London Midland's franchise comes to an end in December. Everyone hopes the new train operating company will be as supportive as London Midland were. ART ALERT SHORTLISTED FOR BEST COMMUNITY ENGAGEMENT EVENT! 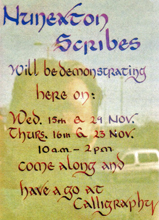 Debbie Squires will be exhibiting some of her work. Art Alert held their monthly meeting, chaired by Roger Elsegood on Friday, 4th August. 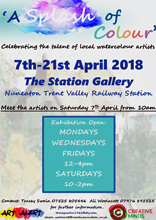 The group were pleased that they now have another new venue for displaying members work which is the former café on Nuneaton Trent Valley Railway Station. At the suggestion of member John Morgan it has been decided that every Friday of the month a "Drop In" session will be held for members from 11.00 am to 2.00pm. Artists will be able to turn up, and bring their work if they wish, for coffee and a chat. Everyone felt this was an excellent idea as members usually only got together for a more formal meeting. 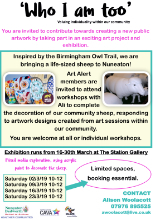 Anne Becker, Exhibitions co-ordinator confirmed that Art Alert will be holding a group exhibition at the Nuneaton Museum and Art Gallery next year from 26th May until 8th July. The title of the exhibition will be "A Decade of Doorways" to represent the tenth anniversary of the group. 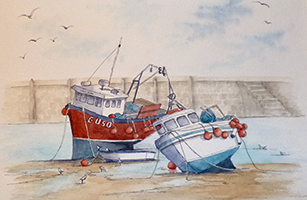 Following this, member Hilary Morris will be holding a solo exhibition "Simply Coastal" which will be from 7th July to 16th September in the Landing Gallery. 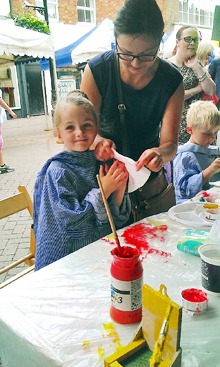 Work is ongoing for the group's next planned event - The Arts Trail, which will be bigger and better than last year. 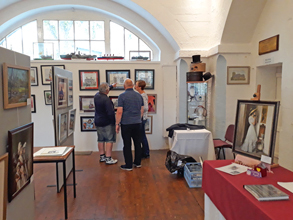 It is planned to hold a "Meet the Artists" session at the Old Railway Gallery nearer the time of the event when the public can meet the artists, see some of their work and collect information and maps of the arts trail. John Commane has his ceramic work on display at Meander & Mooch, a fascinating gallery in Newarke. 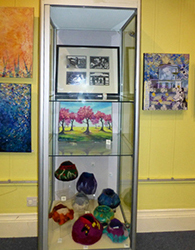 Becca Pullen has work on display in the Sock Gallery, Loughborough. 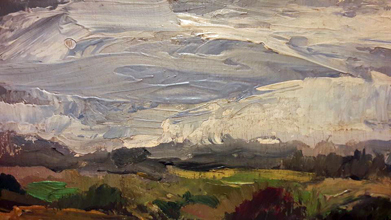 New member, Andy Sargent has taken part in one of the heats for Sky Arts Landscape Artist of the Year. Andy said that although weather conditions on the day were very challenging, he enjoyed the experience, especially meeting Frank Skinner! 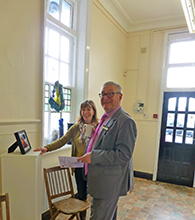 Art Alert held their AGM in the new premises at the Station Gallery, Nuneaton Trent Valley Railway Station on Friday 7th July 2017. Chairman, Roger Elsegood confirmed that in the group's tenth year, membership is growing and one of our great successes of last year was the Open Arts Trail, thanks to lots of hard work by member Pam Hyams. 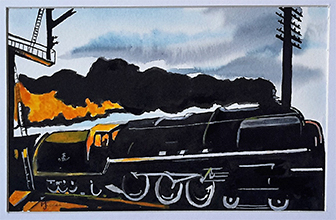 Two other events stood out, namely the exhibition at Nuneaton Museum and Art Gallery entitled "Where the Mood Takes Us" and the collaboration with London Midland, which commenced with an exhibition of work inspired by Nuneaton Trent Valley Railway. 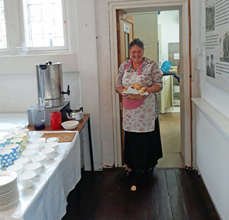 Taking over the old Station cafe has given the group a permanent site for future events, displays and workshops. 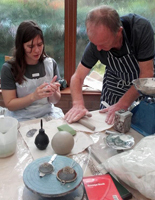 Members Nadine Shaw, Claire Botterill, Alisha Miller, Roger Elsegood and Sarah Bishop have all held art classes during the past year and three members. 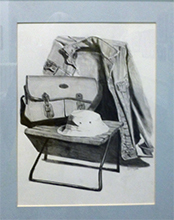 Hilary Morris, Claire Botterill and John Commane have had exhibitions at Nuneaton Museum and Art Gallery. Also many members received awards at the Festival of Arts. 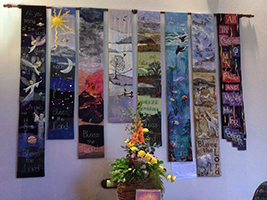 Treasurer Joanne Lole obtained funds for the "Celebration" project, which will be completed in October and has included Art Alert members, The Stitching Group, School groups and Escape Arts. Two members, Anne Becker and Anne Taylor won awards for their work in the community as part of the Museum's centenary celebrations. 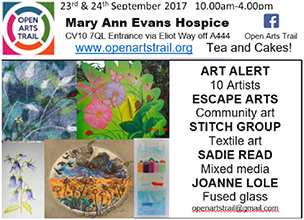 The next event planned is the Open Arts Trail in September. Following the success of last year's trail, this year's promises to the bigger and better with even more venues. At the moment there are still displays of member's work at George Eliot Hospital Outpatients, Abbey Gate and the Mayors Cafe. Finally new member, Andy Sargent was introduced to the group. 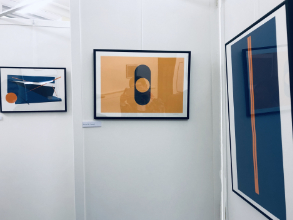 Andy has exhibited at Leamington Spa Open Exhibition and he describes his work as initially appearing abstract but to him it is not. He formulates subjects into forms and colour in a non-traditional sense. Each work is totally unique in its appearance. 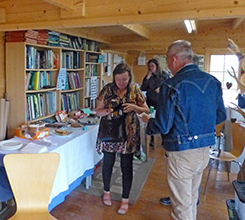 As Art Alert is celebrating its 10th anniversary this year, the meeting closed with a buffet. 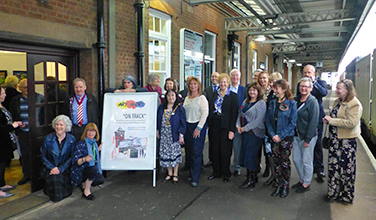 The group met at their new venue - the Station Gallery, Nuneaton Trent Valley Railway Station. It was a lively meeting with the accompaniment of passing trains to add to the atmosphere! The first exhibition at the gallery has gone well with a good footfall and lots of interest in the new premises. Art Alert have lots of plans for future use including the Open Studios in September and future workshops. Several other groups in the area have expressed an interest in using the Gallery for their own displays. 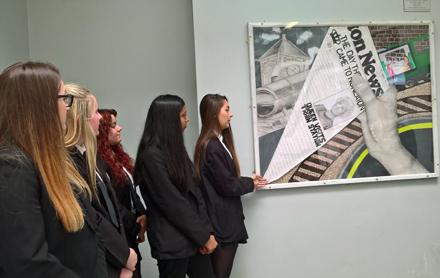 On Friday 12th May, Neil Bamford, Asset Maintenance Director for London Midland Rail visited the gallery and was impressed by what Art Alert had achieved in a short time. The group welcomed four new members, Beverley Jenkins, a potter, Brian Dickinson who works in stained glass, Georgina Burton, an artist and Heidi Kind who works in mixed media. 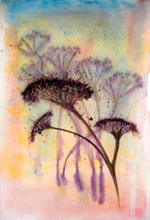 Member, Claire Botterill has an exhibition on the Landing Gallery at Nuneaton Museum called " Seed Heads Revisited". The exhibition starts on 20th May and Claire's beautiful paintings, all inspired by seed heads in her garden, can be seen until 2nd July. 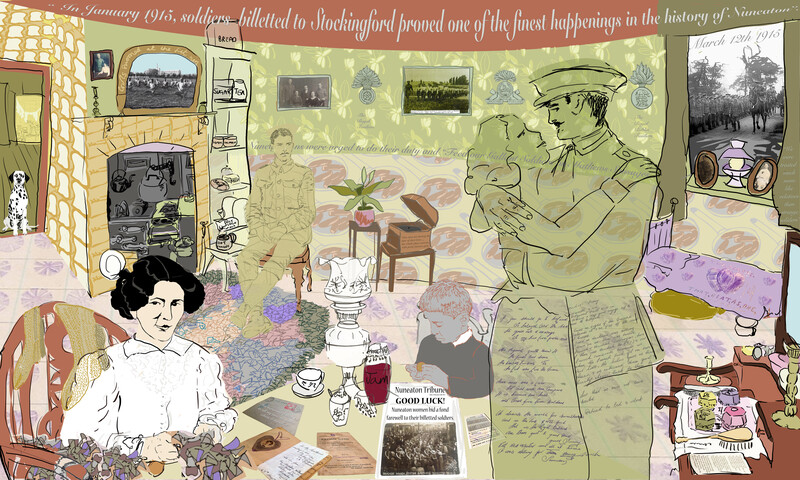 Alisha Miller will soon be making a start on a large mural on the outside wall of Stockingford Pavilion, which was instigated by Bill Olner. 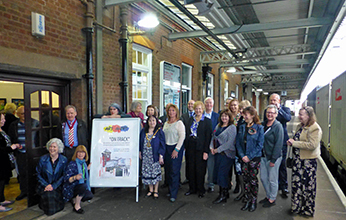 Art Alert, held a preview evening on Friday, 21st April 2017 for their new exhibition "ON TRACK" in new premises at the Station Gallery, Nuneaton Trent Valley Railway Station. 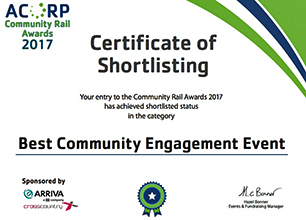 Community Rail is a Government strategy supported by the rail industry that engages with residents, schools, business and local authorities to improve the railway for commuters. Roger Elsegood, Chairman of Art Alert, welcomed everyone to the preview which was extremely well attended by some of London Midland Rail management who had travelled up from London. 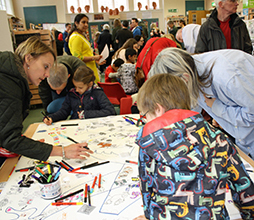 Also present was Faye Lambert, Head of Community Rail and the Mayor, Jill Sheppard together with artists, friends and families. 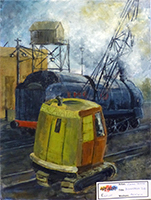 Artists took their inspiration from Trent Valley Railway Station and there is a varied selection of work including paintings, glass and pottery. 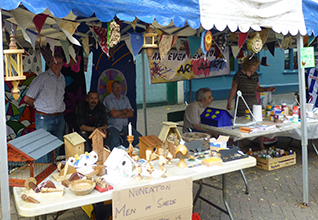 "Men in Sheds", a group linked with Art Alert, worked very hard to a tight schedule to make all of the display stands in time for the opening. Men in Sheds meet twice a week at premises in George Eliot Hospital to socialise and learn new woodworking skills. The exhibition is the first of hopefully many more events at the Station and Members are looking forward to opportunities their future connection with London Midland Rail will bring. 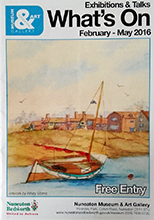 Art Alert met at the Attleborough Arms on 7th April for their monthly meeting. As it is the 10th anniversary of the forming of the Group members decided to apply for a second exhibition at the Nuneaton Museum and Art Gallery. 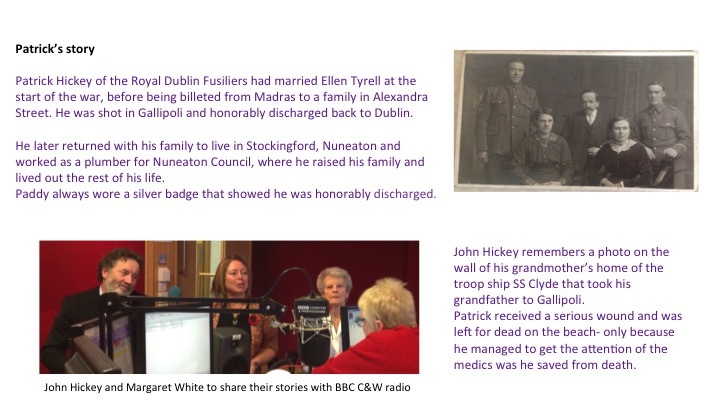 Art Alert members Anne Becker and Anne Taylor have both received awards from Nuneaton Museum, as part of their centenary celebrations. The rewards are for their voluntary work within the community including Art Alert. 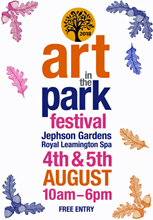 John Commane, potter, is taking part in Leamington Studio's Artists Exhibition at Jephson Gardens. The exhibition runs from 5th April to 30th May from 10.00am to 5.00pm. 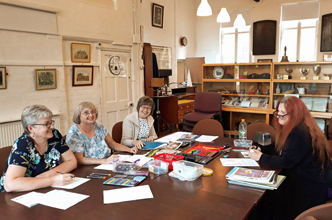 The group welcomed two new members, Tracy Swain who paints watercolour landscapes and Alison Woolacott, a fine artist who has given up work to concentrate on her art. 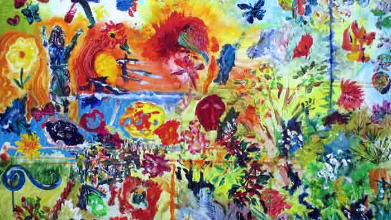 She has a background in conceptual art and is now using acrylics and working on projects with dementia sufferers. Work is ongoing to the Group's new exhibition space at Room 6, Trent Valley Railway Station, Nuneaton. 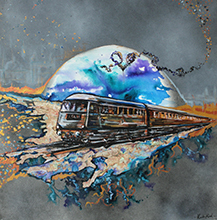 The exhibition entitled "On Track" (example work pictured below), inspired by the station, commences on Saturday, 22nd April at 11.00am and will be opened by Marcus Jones MP. 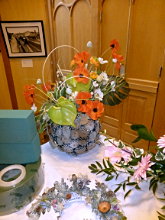 Work will be on display for three weeks on Wednesdays, Fridays and Saturdays from 11.00am to 3.00pm. Following on from the exhibition will be a Station project involving Etone School and Kegs College, organised by Art Alert member Corinne Davies. Students will be producing artwork for display in two station waiting rooms. Future meetings of the group will be held at Room 6, Trent Valley Station, 11.00am on the first Friday of the month. 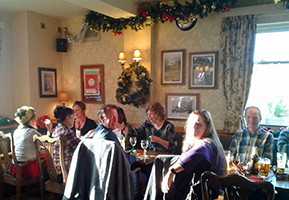 Art Alert held their monthly meeting at the Attleborough Arms on Friday, 3rd February. 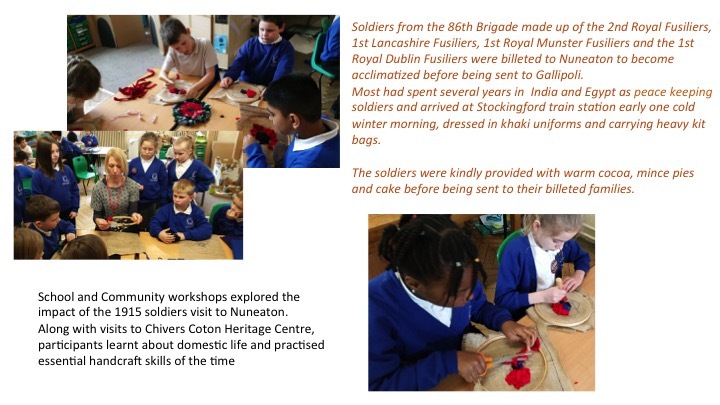 Following the success of their exhibition at Nuneaton Museum and Art Gallery, Art Alert congratulated members who were awarded seven prizes in the Arts Section of the Nuneaton Festival of Arts. Winners were Nadine Shaw, Pam Hyams, Lin Goodwin, Roger Elsegood and John Morgan who received 1sts, Merits and a 3rd between them. Lin Goodwin was also awarded the Frances L Fawcett award. The Group are also forming a connection with London Midland Rail. 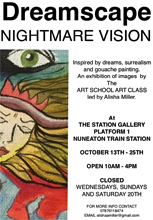 Art Alert is to be given funding for the use of the old café room on platform one of Nuneaton railway station to be used for exhibitions and workshops. 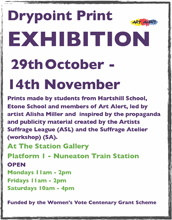 The railway station is an iconic part of Nuneaton's history and the group are delighted to be involved. 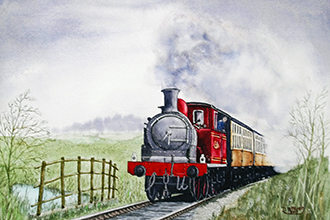 Railway enthusiasts will be pleased to know that It is hoped to hold a railway themed art exhibition by late April. As last year's Open Arts Trail was so popular, the group are planning their second event to be held on 23rd/24th September 2017. This year it is hoped there will be even more venues, including Nuneaton Railway Station and extra venues in Bedworth. Anyone interested in joining Art Alert can contact them through facebook, find details on the contact page of this website or join them for one of their informal meetings at the Attleborough Arms every first Friday of the month at 11.00am. 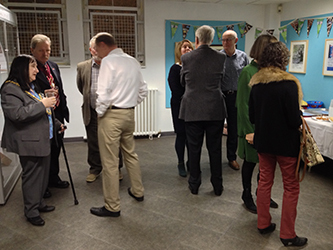 Art Alert held a Launch Party for the Group's exhibition at Nuneaton Museum and Art Gallery which commenced on 16th December. 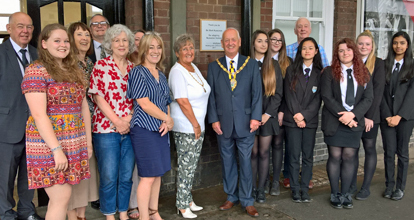 The Launch was attended by the Mayor, Jill Sheppard and her consort Bill Sheppard, Councillor Neil Phillips, County Councillors Bob Hicks and Corrine Davies, and Maxine Tuffin from WCAVA. Also many of the artist's friends and family came for a first view of the exhibition "Where the Mood Takes Us". Visitors are invited to walk around the exhibition which will take them through many moods and emotions, from the darkness into movement and finally into calm and tranquillity. All of these emotions are depicted by paintings, glass and pottery. More than twenty talented artists, professional and amateur, have their work on show in this second exhibition to be held at the Museum by the group. The majority of the work is for sale, and can be viewed until Saturday 21st January 2017. This will be the end of a very successful year for Art Alert, despite losing their pop-up gallery earlier in the year due to the closure of the Co-op. They now have a regular meeting place at the Attleborough Arms and have work permanently on display at the Peoples Cafe, Bedworth, George Eliot Hospital Outpatients and Abbey Gate. 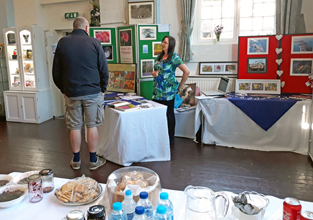 Art Alert were part of the Nuneaton Lives celebrations in July, and hosted their very first Open Arts trail in September, which was a resounding success, with many visitors at various venues around the district. The group are hoping that this will become an annual event. In addition to this the group has hosted community events, many in conjunction with "Escape Community Arts". Art Alert is always seeking new members and anyone interested in joining can contact the Group by visiting their web site artalertnuneaton.co.uk, visit their Facebook page or simply come to one of their informal meetings which are held every first Friday of the month, 11.00am at the Attleborough Arms. 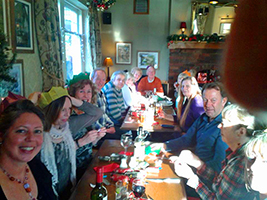 Art Alert met for their annual Christmas lunch at the Attleborough Arms on Friday, 2nd December and enjoyed good food and a lively atmosphere.The Group have been busy finalising work for their exhibition at Nuneaton Museum and Art Gallery. The exhibition starts on the 17th December and runs till 22nd January. Entitled "Where the Mood takes us"; visitors are invited to explore the way in which they can have an emotional response to the artwork on display. 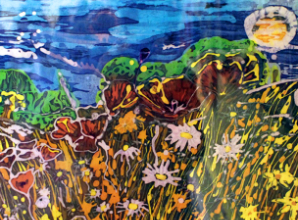 There will be a large variety of work to see, including paintings, ceramics, textiles, pottery and glasswork. 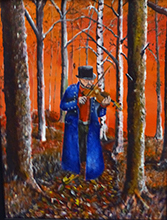 Also on display at Bedworth Art Centre, is a selection of paintings by Art Alert member Nadine Shaw. 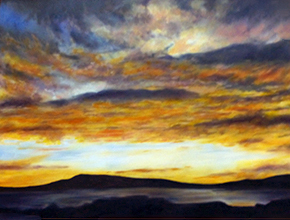 Nadine uses a variety of mediums, and her work will be on display until the end of December. 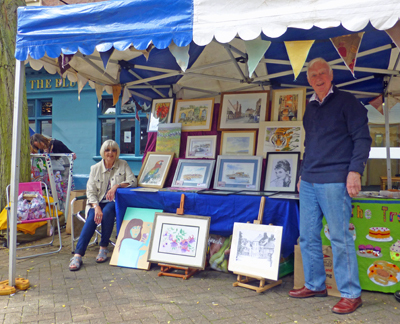 Nuneaton had its very first Open Arts Trail on the weekend of 24th and 25th September 2016 and everyone agreed it was a resounding success with lovely weather and a great amount of interest. 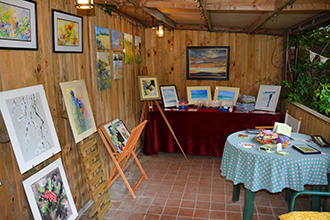 Local artists group Art Alert, along with other artists, used various venues around the local area and opened their own homes, gardens and studios to members of the public for two days with many of the works on display for sale. 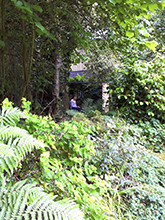 Visitors were able to follow a trail map and visit up to thirteen venues including The Heritage Centre, Scout Headquarters, Greenmoor Road Allotment Pavilion and St James Church. A rich diversity of work was on display including paintings, ceramics, textiles, stained glass, wood turning and jewellery. Everyone on the trail was able to see artists doing demonstrations, and homemade cakes and soft drinks were available at many of the venues. Footfall was measured, and the amount of visitors surpassed all expectations. This is an event that will definitely be repeated. Art Alert held their monthly meeting at The Attleborough Arms on Friday, 2nd September. 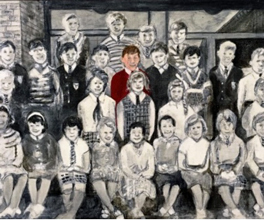 Member Claire Botterill is delighted to be informed that her painting "Glasgow School of Art" has been selected for this year's Open Exhibition of the Society of Graphic Art at the Menier Gallery, Southwalk, London. 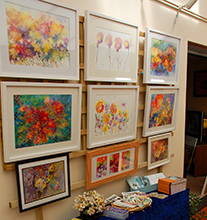 Claire is an established fine art artist whose work includes landscapes and floral studies in a wide variety of mediums. Most of meeting was spent discussing the Open Arts Trail in which Art Alert is heavily involved. 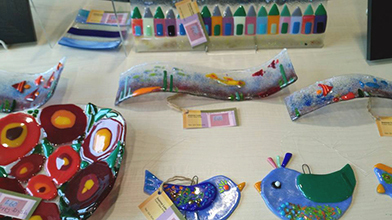 The Arts Trail, a first for this area, takes place on the 24th and 25th September and talented artists will be showing their original work at venues across the region, including Bedworth Arts Centre, Nuneaton Heritage Centre, Nuneaton Scout Group Headquarters and Greenmoor Road Community Allotments. Also various artists will be opening their homes and studios to the public. Trail maps are available from Nuneaton and Bedworth Libraries, Town Hall, Abbeycraft or can be downloaded from www.artalert.nuneaton.co.uk. This promises to be a wonderful event, and several of the venues will also be offering refreshments. Download brochure & map here. Local artists are invited to take part in an exciting Nuneaton Arts Trail to take place on September 24th & 25th 2016 in several venues in the area. The Trail is open to friends and partners as well as Art Alert members and we aim to include a wide variety of 2D and 3D work. 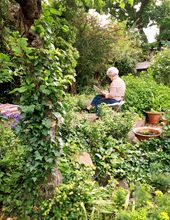 We have several artists who are opening their houses and gardens for the event from Fillongley to Bedworth, plus the Heritage Centre, George Eliot Hospital and Greenmoor Road Allotment Shed. Do you have a home studio you would like to share? Are you part of an art group who could put on a display of work? Would you be interested in joining another artist to show a contrasting selection of work? Warwickshire Open Studios are supporting this Trail and we will be producing quality flyers and PR materials, which with good local press coverage and extensive networking will ensure local coverage and good attendance. If you would like to join in with this ground breaking opportunity to put local art and artists on the map please contact us at info@artalertnuneaton.com or call 02476 741276 with expressions of interest ASAP. A kick off meeting has been arranged for Friday 29th April 11:00 at the Attleborough Arms, Highfield Rd, Nuneaton CV11 4PL - so please join us then. Lin Goodwin is a valued member of Art Alert, who is always involved in exhibitions and community events and maintains the group's Facebook site. She is delighted to be featured in the website painters-online.co.uk and one of the paintings which can be seen is " Songbirds", a mixed media picture in pastels and coloured pencils. 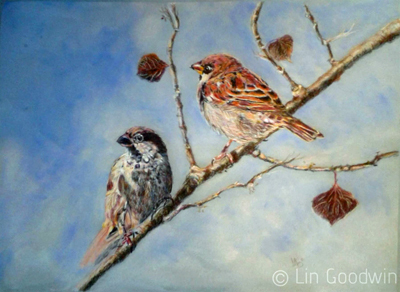 Lin works from photographs and recently became interested in bird watching and this painting is one of the results. 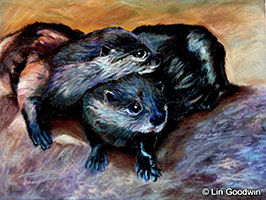 Lin is a self-taught artist and she uses art as a therapy which helps with her poor health and disability. Although she is proficient in many different mediums, her favoured one is coloured pencils and she is a member of the UK Coloured Pencil Society. Her favourite subjects are vehicles and animals. 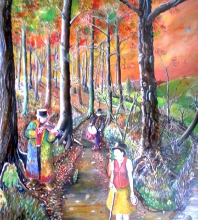 Lin had her first solo exhibition at Bedworth Arts Centre in 2012 and as well as exhibiting with Art Alert, also shows work regularly at Nuneaton Museum and Art Gallery. 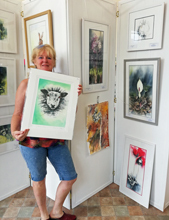 She won a First Prize at this year's Festival of Arts with a pastel drawing of two lions entitled "Happy Couple". 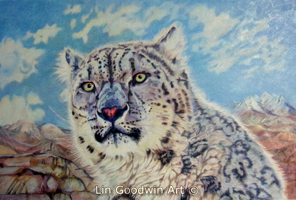 Lin has work on display all around the world including USA, Canada, France and Spain. 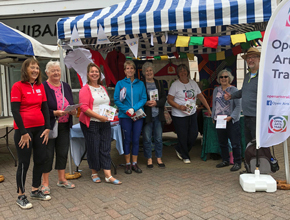 Local artist's group, Art Alert were delighted to be part of Nuneaton Lives on Saturday and luckily, there was only one downpour to contend with. 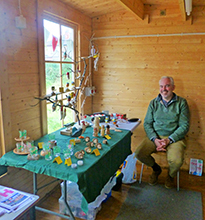 "The TreacleTarts' " stall was very popular as they were selling delicious home made cakes, and "Men in Sheds" were displaying their handmade wooden goods such as bird boxes, mug trees, wooden owls and garden ornaments. Art Alert had a varied display of members’ paintings and pottery for sale. Art Alert member, Pam Hyams is busy organising an exciting "Open Arts Trail" to take place 24/25th September. Talented local artists, professional and amateur will be sharing their works in their own studios, Scouts HQs, an Allotment Pavilion, The Heritage Centre, halls and their own homes. 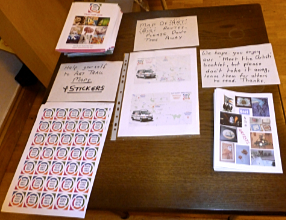 Most of the work will be for sale and light refreshments available at some of the venues. 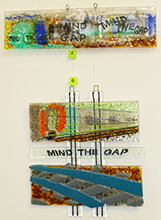 Example work by Art Alert member Nadine Shaw is on display in the Abbeygate Shopping Centre in Nuneaton. 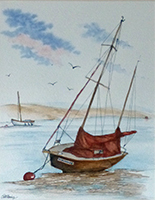 Hilary returns to Nuneaton Museum & Art Gallery to present a selection of 'pen and ink' and colourwash pieces. Pictures depict different boats on different beaches and harbours. There will be artwork for sale in this show. 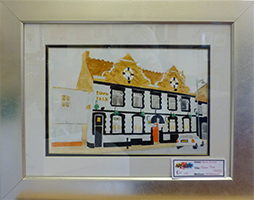 Art Alert met at their new venue, the Attleborough Arms, at the beginning of the month and members were asked if they could donate a piece of work for a Fine Art and Illustration Auction at the Herbert Art Gallery in Coventry. 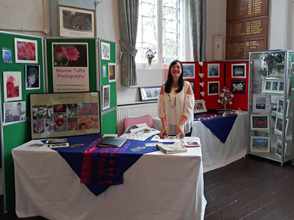 The organiser, Emma Phillips had helped at the Art Alert Gallery and also with "Escape" - a group linked with Art Alert, as part of her work experience. Several pieces were donated and the Auction held on Friday 11th March was a great success, with all proceeds going towards funding an "End of Year Degree Show. 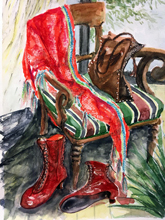 There has been a change of work on display at George Eliot Hospital Outpatients, and member Nadine Shaw now has a varied selection of paintings on show. 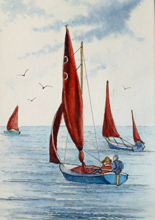 Member, Hilary Morris will be holding her fourth exhibition at Nuneaton Museum and Art Gallery. 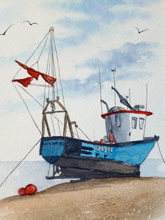 The display is entitled Coastal Moorings, and is a collection of pen and watercolour paintings inspired by Hilary's love of the British coast. The exhibition commences on 9th April and work will be on display until 5th June. 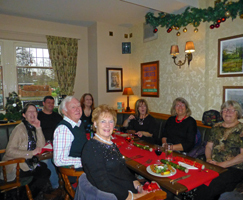 The Art Alert group held their first meeting this year at their new venue, the Attleborough Arms, Nuneaton. 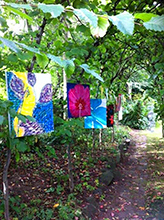 The artists are currently moving around venues with their displays, and Julie-Ann Simms has moved from the People’s Café, Bedworth Miners Welfare Park to George Eliot Hospital, where she is showing a group of paintings depicting park life, and a collection of sculpture made from recycled items. Following Julie in the café in Bedworth is Lin Goodwin. 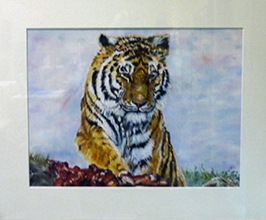 Lin's speciality is coloured pencils, and she has several new pieces of art on display, "Stand Off”," Otters" and "Irma the Snow Leopard" from Twycross Zoo. 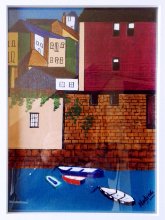 Hilary has moved her seascapes from the George Eliot Outpatients, where she was pleased to sell two pieces of work, and they can now be seen in one of the empty shop premises in Abbey Gate. 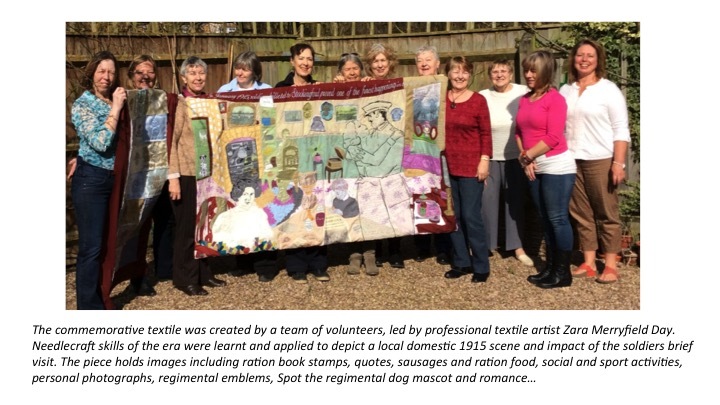 Following the success of the WW1 piece of collaborative textile work, the group is staying together with the aim of producing another piece of work, possibly depicting canal life. This would be a result of a forthcoming canal trip on 16th March, to which Art Alert members are invited. 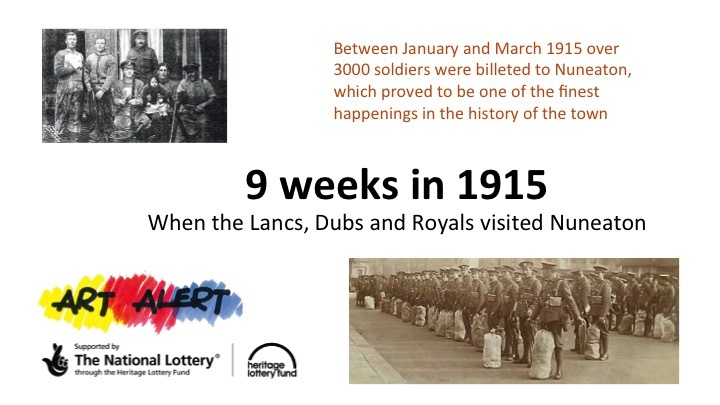 Through research, working with local historians and interviewing people with memories and memorabilia, Art Alert have explored the time when in 1915, 3,000 soldiers were billeted to Nuneaton and housed with local families to be acclimatised before being sent to Gallipoli. Research tells of a sense of excitement and romance, of local businesses, social activities and sports clubs being revitalised and personal stories both tragic and joyful. 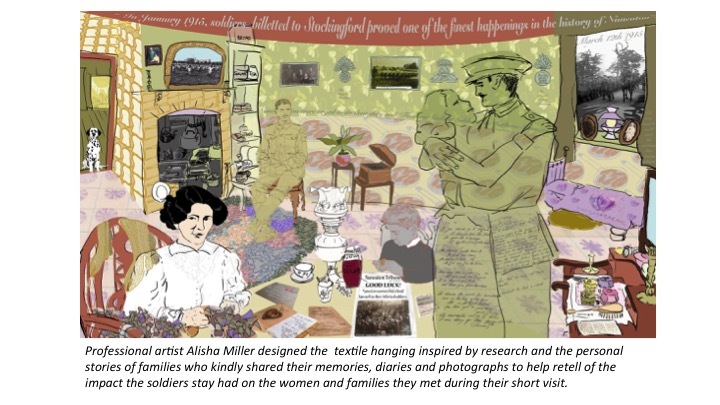 Working with professional artist Alisha Miller, and professional textile artist Zara Merryfield Day, a group of volunteers have created a textile hanging to capture the story from the perspective of the women at home. The textile hanging and an information banner will be exhibited throughout the area. Art Alert met at the beginning of November at Nuneaton Heritage Centre and welcomed two new members, Julie-Ann Simms and John Freeman. 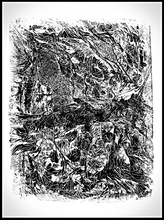 John's work includes woodcutting, printmaking and acid etching. 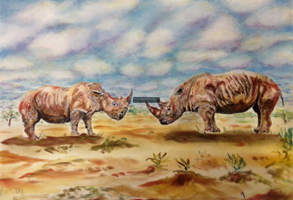 Julie-Ann has taken the brave step of leaving work and starting life as a full time artist. She likes to work on different projects in various media including pastel, watercolour, ink and collage. Two of her recent projects are "Park Life", which explores the sense of escape parks can create for a range of people through the seasons and "Do Take Muriel Out" inspired by the poem of the same name written by Stevie Smith, which is rooted in nostalgia for the 1950s. 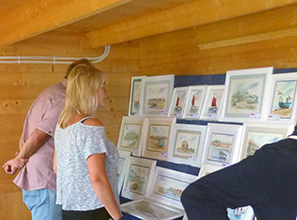 Members have a busy month with work on display in various locations around the town. 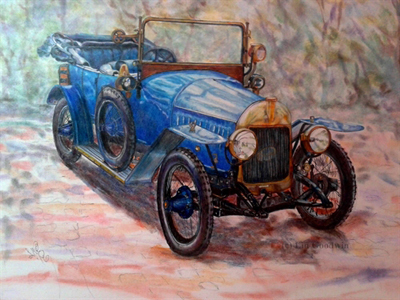 Lin Goodwin's beautiful work in coloured pencil is currently on show in AbbeyGate, Nuneaton. One of her pictures "Zebra's Kiss" won an award at this year's Festival of Arts. 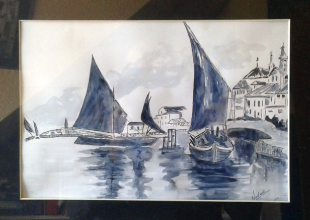 Hilary Morris has her pen, ink and colourwash seascapes, along with John Commane's pottery, on display at the Outpatients department of George Eliot Hospital. 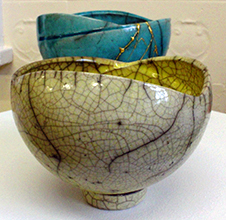 John's pottery is also part of "Take Five" an exhibition of five artists' work at Nuneaton Museum. New member, Julie-Ann has work from her project entitled "Park Life" in The Peoples Cafe, Bedworth Miners Welfare Park. We are a group of men who meet twice weekly to socialise, share skills, make stuff, and have a cuppa and a chat. If you are male, want to get out more, meet new friends and have a go at being creative with friendly guidance, then come along and have a try. We meet every Tuesday & Thursday at Nuneaton George Eliot Hospital from 10:00 till 12:00. 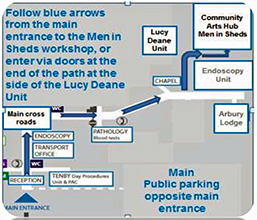 (Come in by the Maternity entrance; by Lucy Deane Renal Unit. Art Alert members have a new home. 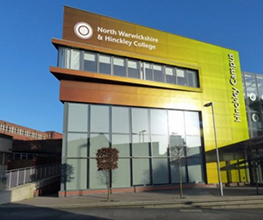 North Warwickshire and Hinckley College have kindly offered to share their impressive premises in Abbeygate in Nuneaton with us. The group warmly welcomed Roger Elsegood back to Chair the September meeting there after he had suffered a bad injury to his ankle following a fall. Our first event in Abbeygate will be the "Big Draw” to be held in conjunction with the college, and the theme is "Pop Goes Nuneaton", a graphic story/pop art theme. The event takes place on Saturday, 24th and Wednesday, 28th October from 11.00am to 3.00pm. There will be more information nearer the date. 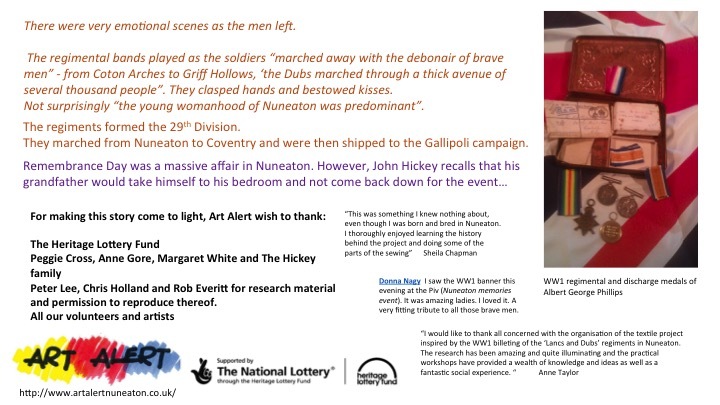 Member, Hilary Morris received good news from Nuneaton Museum and Art Gallery. They have offered her an exhibition at the Gallery in Riversley Park from April to June 2016. 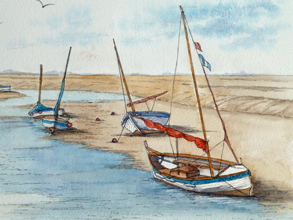 Hilary works in pen and ink and watercolour, and her exhibition will be called "Coastal Moorings"
a collection of pictures inspired by beaches, harbours and estuaries around the British coast. 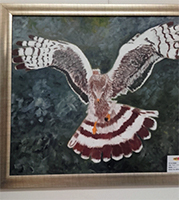 Another Art Alert Member, Pam Hyams has her beautiful nature inspired paintings currently on display at the new creative hub L.C.B Depot, Leicester. Outpatients Department at George Eliot Hospital and Fishbowl Gallery, Bedworth. 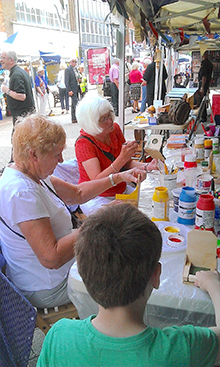 Art Alert has been busy this month, mainly in their involvement with the "Nuneaton Lives" event on Saturday, 4th July. 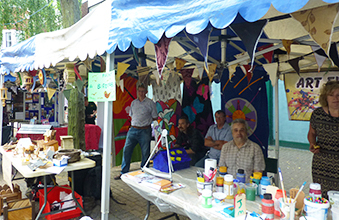 The weather was sunny and warm for the volunteers on the four stalls manned by Art Alert, Men in Sheds, Escape Community Arts and The Treacle Tarts. 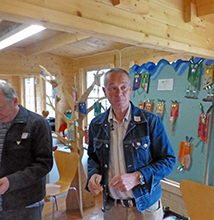 Men in Sheds had made small wooden bird seed feeders at their workshops, and Escape and Art Alert encouraged people to paint them. They could then be screwed to a wall or a tree for the garden birds to feed from. 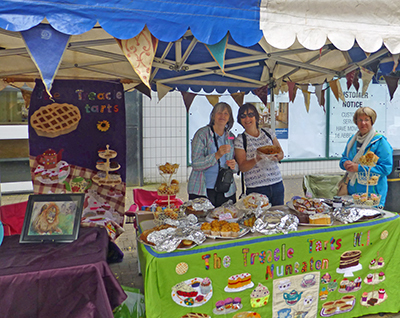 If all that painting made you hungry, Nuneaton WI group - The Treacle Tarts had a delicious selection of homemade cakes on the adjoining stall, all made by their members. 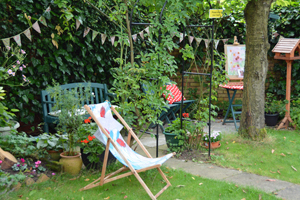 On June 27th and 28th, Pam Hyams, an Art Alert member opened her home and garden as part of Warwickshire Open Studios. 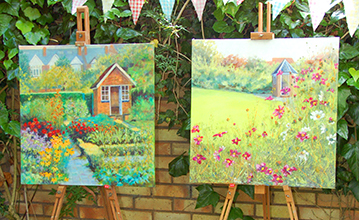 Her home and garden were full of flowers, which set off her beautiful paintings inspired by nature. 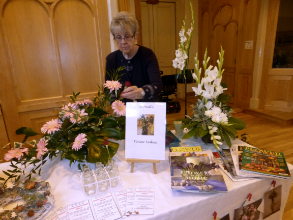 Tea and cakes were on offer together with an opportunity to watch a watercolour demonstration by Pam. Art Alert meet for an informal get together every first Friday of the month at 11.00am at Nuneaton Heritage Centre, Avenue Road. Anyone is welcome to come along or you can find us on our Facebook page which will also have news of all our up and coming events. 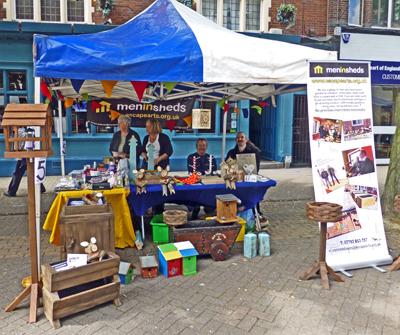 Art Alert and Men in Sheds both had stalls in Abbey Street, Nuneaton on Saturday 4th July as part of the Nuneaton Lives event. 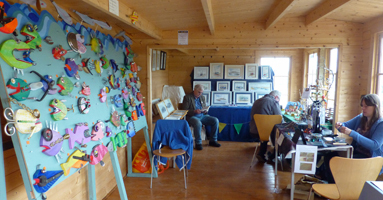 Men in Sheds made birdfeeders and these were painted by members of the public on the Art Alert stall. 23 Nuneaton town centre venues will take part in a shop front trail event created by Escape Arts Nuneaton Group, in partnership with Nuneaton Business Alliance and Warwickshire County Council. Escape Arts Nuneaton received a grant from WCC Councillor Bob Hicks to research and deliver a project relating to ‘Nuneaton Cinemas of the Past’, in readiness for Nuneaton Lives 2015 event on July 4th. The project consists of an exhibition of artwork, facts and memories gathered during workshops and open days at The Heritage Centre, plus the town centre shop front trail. Escape Arts will also be showcasing their cinema artwork at George Eliot Hospital. To take part in the Nuneaton Town Centre Shop Front Trail: “Cinemas of Nuneaton Past”, download the map and question PDFs, seek out the numbered posters in the participating venues and answer the clues. 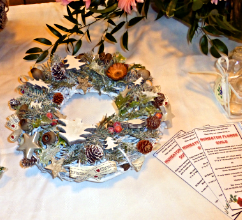 Return forms to Katz (venue 16) to enter a free prize draw. Alternatively, a map and questions sheet may be obtained from Katz. The group are currently holding their monthly meetings at the Heritage Centre, Avenue Road since we lost our pop-up gallery. We are still looking for any possible empty premises suitable for display of members work. Currently we have a display of cinema related paintings by member Roger Elsegood on display in empty shop premises in Abbey Gate. 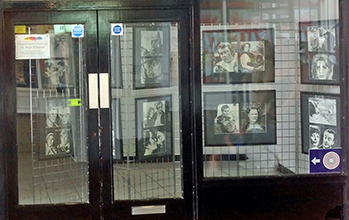 This is in connection with the Town Centre Shop Front Trail - Cinemas of Nuneaton Past, an Escape Arts event. Running from 19th June to 12th July this will be a film themed shop trail involving 23 shops. 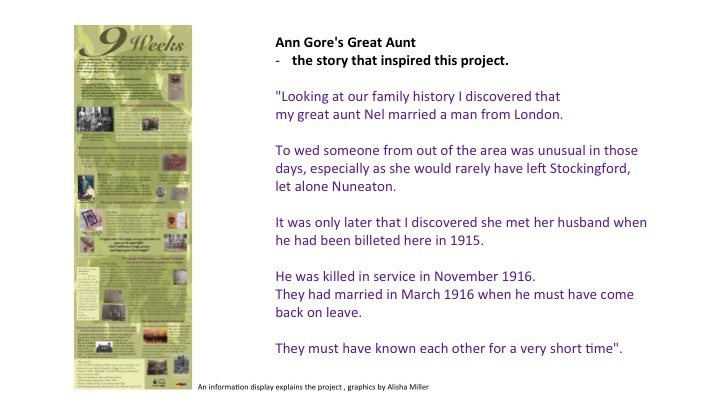 Maps and Question sheets can be found on various websites including Art Alert, Nuneaton Lives, WCC News, "Memories" and Escape Arts. We are making plans for "Nuneaton Lives Festival " on 4th July. 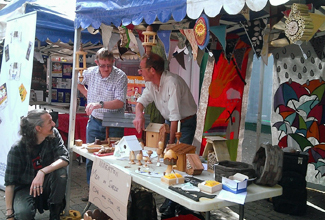 We will be having four stalls manned by Escape Community Arts, Men in Sheds, Treacle Tarts and Art Alert. 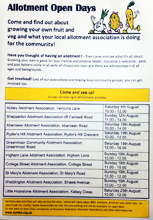 They are planning workshops, displays of members work and home made cakes. 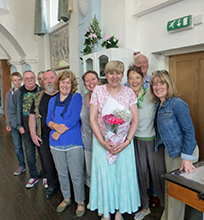 Finally, we had to say a sad farewell to Kath Jones, one of our founder members, who will be very much missed. Kath is moving away but has promised to come back and join in our events whenever she can. It was rather a sad monthly meeting for the group, as our time at the Pop Up Gallery in Abbey Street has to end. We have been really fortunate that the initial three-month lease has lasted for 15 months. 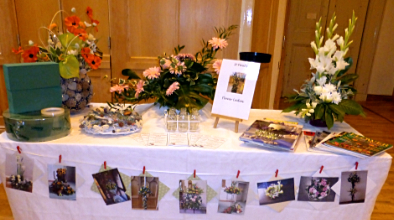 The gallery has been a great success with sales of arts and crafts, regular displays and community events. But the premises are now to be let. The gallery closes at 4.00pm on Saturday, 11th April but the Heritage Centre in Avenue Road have kindly offered us the Schoolroom as a permanent exhibition space as well as an area for our meetings. In the meantime the Lego Club and Men in Sheds will also be held there. Unfortunately, due to the problems finding a venue, our planned sewing classes will have to be put on hold, but we are hoping to restart them in the autumn. 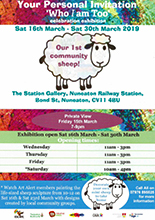 Art Alert will still be holding exhibitions and community events as before and are planning to become involved in "Nuneaton Lives" again. 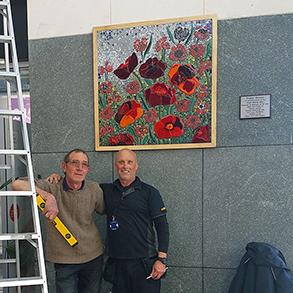 The poppy mosaic is now completed and looking spectacular and will soon be on permanent display in the Rope Walk in Nuneaton. Member's work is always on display in George Eliot Hospital outpatients. 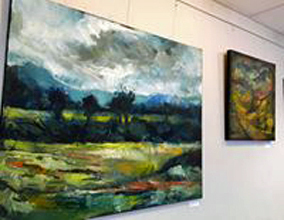 At the moment paintings by Adrienne Barton and jewellery by Claudia Forster can be seen. 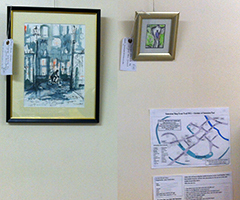 We also have work exhibited at the café, Miner's Welfare Park, Bedworth and at the Community Café in Nuneaton. 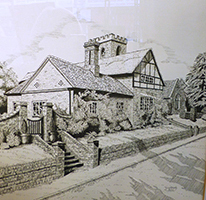 Member, David Witcomb has a display of his accomplished pen and ink drawings at the Nuneaton Museum and Art Gallery entitled "Historical Gems of Warwickshire" and is on until 31st May. The Art Alert Gallery in Abbey Street is still proving popular, with many visitors returning regularly to see new pieces of work and displays. 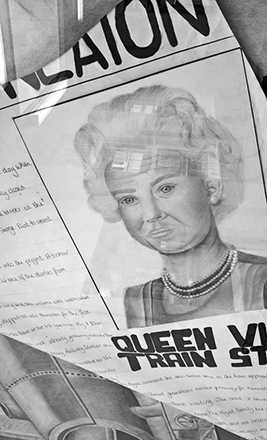 We are currently holding an exhibition in the shop front window of "Scenes of Nuneaton Life". 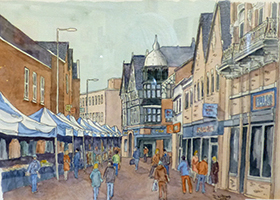 There are a variety of drawings, paintings and photography depicting Nuneaton. Most of the items on show are for sale. We plan to make this a regular feature every few months with a different theme each time, to give new inspiration to our artists. 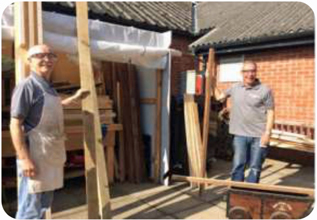 "Men in Sheds" is our new group aimed mainly at retired men with time on their hands who can meet for a cuppa and a chat and try their hands at different skills, including wood turning. The group is currently meeting at the Art Alert Gallery, Abbey Street but are desperately looking for more suitable premises where they can practise their skills. An empty unit or large shop close to the town centre would be ideal. They would also appreciate any donations of unwanted wood or tools. If anyone can help, they can contact Alan Fox on tel. no 07882 946495. Group member, David Witcomb is holding an exhibition of his skilled pen and ink drawings of Warwickshire in the Nuneaton Museum and Art Gallery in April and May. More news on that next month. Our Sewing Club run by Nadine and Alice will start again on 16th April for 5 - 6 weeks. The club, aimed at novices who need some help with their sewing skills, runs for 5 - 6 weeks from 7.00 - 9.00pm, Thursday evenings at the gallery. Anyone interested can contact Nadine on tel.no. 02476 312916. Anyone who would like to visit our Gallery can find it in Abbey Street near to the Co-op, and we are currently open Wednesdays and Saturdays 10.00am - 4.00pm but are hoping to re-open on Fridays as well, as from April. 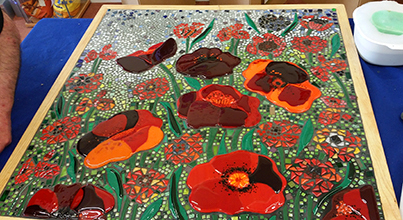 The Poppy Mosaic is now complete and waiting to be installed at the Rope Walk in Nuneaton. The piece has been worked on by Queens Rd School, Escape Community Arts, members of Art Alert and members of the public during open sessions at the Art Alert Gallery. Exciting new project coming up - Watch this space! The Gallery is quiet at the moment, as to be expected after Christmas, but this is giving the members time to plan events for the coming year, and to get painting in readiness for our next event which will be an exhibition entitled "Scenes of Nuneaton Life". All of the works will be by Art Alert members and will be on display from the beginning of March in the gallery, Abbey Street. For the first time this year, we have decided to participate in "Warwickshire Open Studios 2015". This exciting event is an opportunity for artists to show their work at a variety of different locations in the local area and Art Alert plan to have an arts trail for the display of members work at venues, including our Gallery in Abbey Street, Community Cafe, George Eliot Hospital outpatients, Bedworth Fishbowl Gallery and The Mayor's Cafe in Bedworth Miners Welfare Park. The event takes place on 27th June until 12th July at around 144 venues in Warwickshire. 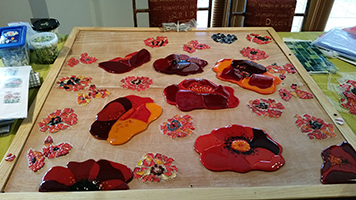 Following on from our successful involvement in the World War One Heritage Fund Project, Art Alert, in conjunction with Queens Road School and Escape Arts are in the process of producing a beautiful glass mosaic featuring poppies, which will eventually be on permanent display in the Rope Walk in Nuneaton. 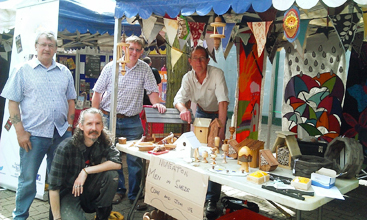 The "Men in Sheds" club, set up for men with an interested in handicrafts to meet and share a cuppa and a chat, got off to a flying start with an initial meeting at the gallery with Alan and Scott. 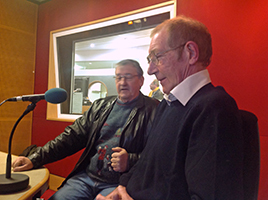 The group are planning to visit the very successful "Men in sheds" group in Stratford to gain inspiration and ideas. Our popular "Love Lego Club" for 7 - 12 year olds takes place every other Saturday at the Art Alert Gallery, and commenced on Saturday 7th February from 10.00am until 12.00am. The club is also held every Wednesday from 3.45pm to 5.15pm. 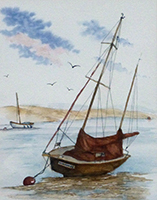 There will also be more painting workshops held by local artist, Claire Botterill, whose work is always on display in the Gallery on 12th and 22nd February from 10.00am to 1.00pm. 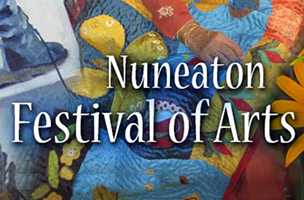 Here’s the upcoming calendar of events for the 2015 Nuneaton Festival of Arts. 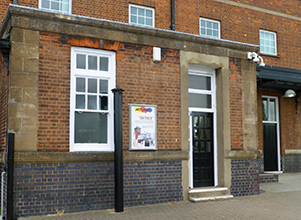 Most Art Section events take place at Museum & Art Gallery, Riversley Park, Nuneaton. More info can be found in the Festival of Arts Syllabus 2015. Well, here we are at the end of 2014 and what a year it’s been! We had an amazing 9 months - 6 months longer than anticipated - in The Art Studio. Thank you to the Co-op for allowing us to use the space for so long. During that time we organised many workshops including print, woodwork, textiles, ceramics, stained glass, needle and wet felting, watercolours, floristry and creative writing, bringing people into Nuneaton Town Centre and thus achieving our aims and satisfying the brief for Warwickshire County Council Footfall Funding which initially took us there. We worked with Abbey Ward residents, both young and old with the bird feeder project thanks to funding from Abbey First, were involved in the Art Alert project celebrating the life and achievements of Reginald Stanley, opened our doors for Warwickshire Open Studios and created wonderful banners, bunting and flower cart for the Nuneaton Lives event in spite of finding the studio flooded just 2 weeks before the event with much still to be completed. But we did it!! We were also involved in Compton Verney's world record breaking attempt for the longest ever bunting and we won a 1st Prize in the Nuneaton Festival of Arts with 'Archimboldo'. We were very fortunate to have Alisha Miller as artist in Residence for the first 3 months while she worked on her Bus Station project, now installed - take a look next time you're near the bus station. The artwork looks wonderful. Alisha also ran a very successful Lego Club which continues as before but now in the Art Alert Gallery, 23e Abbey Street where you can also attend art and craft workshops as advertised on their Facebook page: https://www.facebook.com/pages/Art-Alert-Nuneaton/225950737592907. 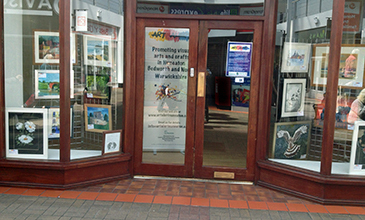 The Art Alert Gallery exists through the support of Escape Arts and to promote Escape Arts in Nuneaton so do encourage friends and family to call in and take a look at the wide range of beautiful and unique gifts on offer all created by local artists and crafts people. Now we are happily ensconced in the lovely Heritage Centre and would like to thank everyone for making us so welcome. I think we all agree it’s a wonderful venue. We’ve completed our final project of the year with Zara and again, I’m sure you’ll agree, it’s been great having her working with us and we can’t wait to see the finished hangings. We’ve achieved more than we ever anticipated this year and would like to thank all those who ran workshops and our volunteers, and everyone who attended them, Art Alert and Escape Community Arts for their invaluable support in sustaining our project and those who gave and continue to give us funding, without which, none of it would be possible. We can look forward to the next year knowing that funding has been secured that will enable us to continue running Escape art and craft group for many, many months to come. 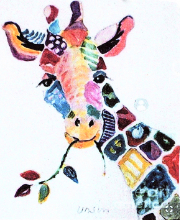 Our first session is on January 15th when we’ll be revisiting our painting skills, with a twist! 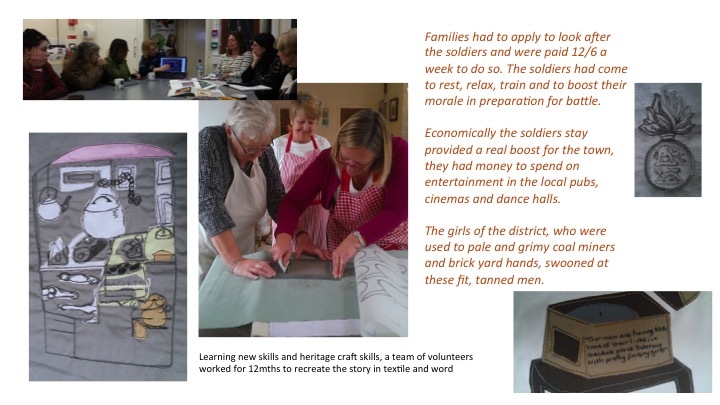 Corinne and Joanne will also be involving the group with a local mosaic project and there will be opportunities to try our hands at traditional crafts. More will be revealed in 2015! 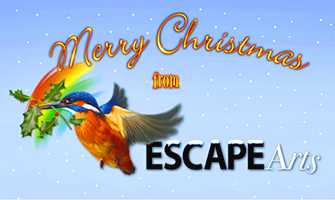 We wish you all a peaceful and joyous festive season and we look forward to seeing you in the New Year.